Ukraine's Embassy in France has called on the international community to increase pressure on Russia for the immediate release of all Ukrainian political prisoners, in particular journalist Roman Sushchenko. 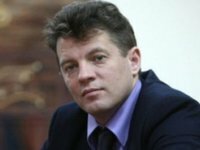 "The Supreme Court of the Russian Federation will make a decision on an appeal in the case of Roman Sushchenko. It is necessary to continue to consolidate international efforts by increasing pressure on Russia to immediately release all Ukrainian political prisoners," the embassy wrote on its Facebook page.